When I started scrapbooking in Japan, I was just using an ordinary table lamp I bought for like $10 in the department store. It was hard to scrapbook, especially at night because I can't really see the colors so well. It was hard to combine colors. So I made my research on the message boards and on the internet, and I learned that a lot of crafters use the OTT-Lite True Color lamps. It claims to make color matching easy, increases clarity, reduces eyestrain and minimizes glare. 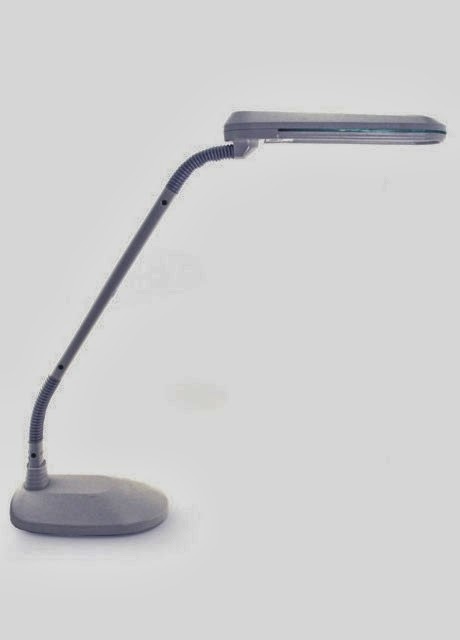 So after little deliberation, and knowing that I need to invest on a good lamp if I'm serious about my crafts, I decided to buy the OTT-LITE® TrueColorTM FlexArm Plus Lamp from Joann's. It was on sale at 50%, plus free shipping. The first time I turned it on, I loved it. Doing crafts was easy on my eyes after that, especially at night. I always like natural lighting when I do my crafts, and my OTT-Lite met that requirement. Joann's is having a sale of up to 50% on their OTT-Lite Lamps right now. The lamp I have in fact is now only $84.99 (originally $169.99), plus free shipping for a limited time. I know it's still not cheap despite the discount, but I guarantee that it's a really good investment for your hobby. Thanks for the info fellow scrapper!